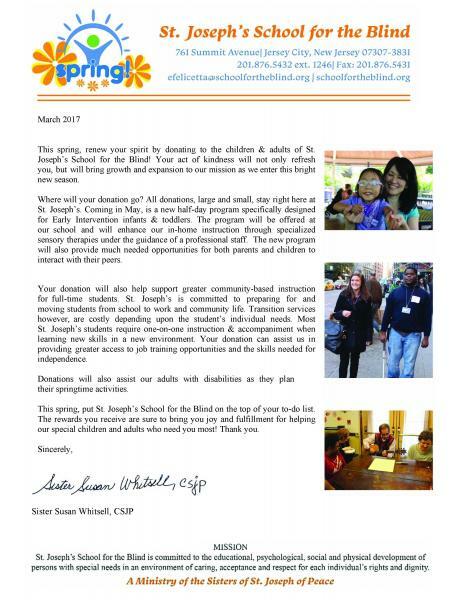 St. Joseph's School for the Blind is a non-profit, 501 (c) (3) organization. The tuition and fees we receive cover about 80% of our expenses. For the remainder, we are dependent upon the generous contributions and grants from individuals, corporations, foundations and government. In addition to gifts that support our annual operating expenses, gifts may be made to our endowment, which is a long-term investment ensuring the future health of St. Joseph's and its programs. of a loved one, asking an employer to match a contribution through our matching gifts program, having a brick engraved for our Portico floor or participating in one of the other unique opportunities available to you. Just as significant are the gifts made by our volunteers, who devote their time, energy and talents to advance the mission of St. Joseph's.